The MWRA’s Deer Island Wastewater Treatment Plant treats an average of 365 million gallons of wastewater each day from 43 communities in greater Boston and is one of the largest electricity users in the Northeast. Deer Island currently self-generates 26% of its electricity needs and more than half of the Island’s energy demand is provided by on-site, renewable generation. 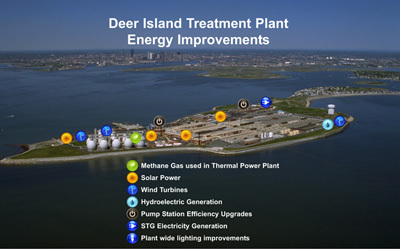 Methane generated from sludge digestion process (“digester gas”) is collected and used in Deer Island’s on-site power plant to create steam that supplies hot water and heat for the facility. The steam is also run through a steam turbine generator that produces electricity. This co-generation facility saves MWRA approximately $15M in fuel oil costs and $2.8M in electricity savings annually. Deer Island electricity has been purchased competitively since 2001. Energy market conditions are characterized by their volatility, and MWRA has sought to balance the ability to respond to changing conditions with maintaining a measure of budgetary predictability. Since 2002, energy is recovered by the flow of treated wastewater as it drops from the plant into the outfall tunnel shaft through two one-megawatt hydroelectric generators that produce over 6M kWh of electricity, avoiding over $600,000 in electricity costs annually. 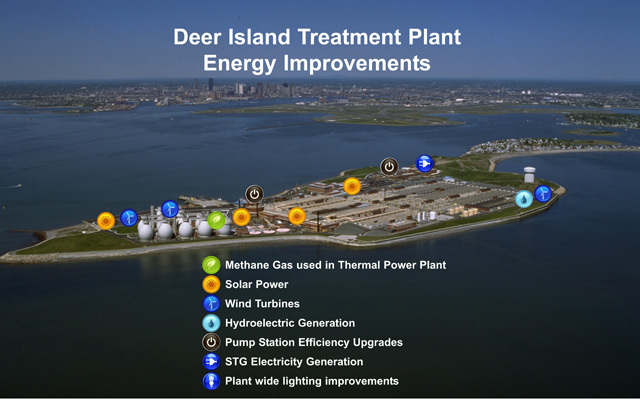 Deer Island can self-generate electricity by running its own two 26-megawatt combustion turbine generators to reduce or eliminate its purchases from the regional power grid. Deer Island participates in the ISO-NE Demand Response Program, by having its generators available to respond to grid demand events. In addition capacity payments MWRA receives from ISO-NE, MWRA also avoids the high market prices that typically occur during such events. Revenue from the program is approximately $500k annually. Deer Island has 736kW of photovoltaic systems installed throughout the plant. A 100-kW roof-mounted solar photovoltaic system was installed on the Residual/Odor Control Building at Deer Island in early 2008. A 180-kW roof-mounted photovoltaic system was installed on the Maintenance/Warehouse Building at Deer Island in March 2010. MWRA executed a Solar Power Purchase Agreement in 2011 for a 456kW photovoltaic system installed on the roof of the Grit Building and on the ground in the south parking lot. These PV projects were partially funded through State and Federal grants. Two 600kW wind turbines (190 ft) were installed and commissioned on Deer Island in November 2009. The wind turbines generate over 2M kWh per year for an annual estimated savings of $200,000. There are plans for future wind turbines on Deer Island as they individually get approved by FAA. 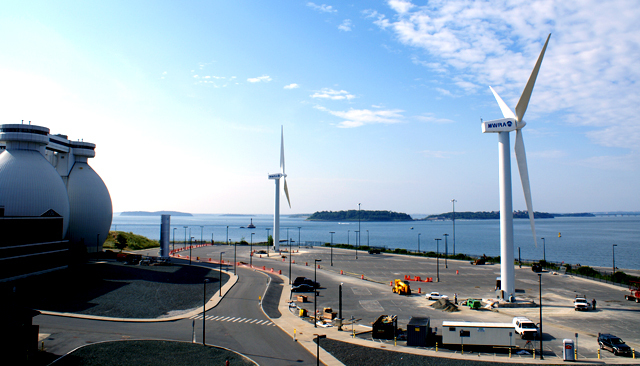 In 2011 an engineering prototype 100kW wind turbine, developed by a MA company, was installed on Deer Island. The FloDesign Wind turbine projects higher efficiency than traditional wind turbines. Engineering optimization of the design and operation of this turbine continues. Electricity generated from digester gas, solar, hydro, and wind are all qualified as a renewable (“green”) sources of energy under the MA Renewable Portfolio Standards (RPS) Program. This program prescribes that a minimum amount of power that is supplied into the Massachusetts market be derived from renewable energy sources. Deer Island is awarded certificates for each megawatt-hour of green electricity produced. Suppliers that do not meet the minimum requirement through their own sources can purchase certificates from generators such as Deer Island, generating over $500k in revenue for MWRA annually. Electrical upgrades are ongoing at the two pump stations to replace the variable frequency drives that power the 18 motors (8 at 1,250 horsepower and 10 at 3,500 horsepower) with more energy efficient technology. Work at the South System Pump Station was completed in August 2007, and work is expected to begin at the North System Pump Station in FY12. MWRA modified the steam co-generation system to optimize use of the digester gas by installing a back pressure turbine at the Thermal/Power Plant. The modifications are expected to increase renewable energy production by 5M kWh per year with annual electricity net savings of approximately $500,000. Testing completed and system currently on line. Deer Island is nearly complete with the first four phases of a multi-phase lighting improvement program aimed at replacing existing lamps, ballasts, and fixtures with high performance fluorescent or induction reduced wattage fixtures, integrated day lighting, occupancy controls, and replacement of “Exit” signs with LED technology. The next phase including lighting controls and outdoor lighting is expected to begin in 2012.